Upgrade is a movie most have never heard of. If they did, they would probably not give it a chance. And that would be a shame. Grey Trace (Logan Marshall-Green) is a man that hasn’t braced the technology of self-automation that runs rampant in his world. So much so, that he works from his garage, fixing up old classic muscle cars, including the one he and his wife, Asha (Melanie Vallejo) are about to deliver to Eron Keen (Harrison Gilbertson), the head of Vessel, a rival to Cobolt, the tech company Asha works for. Eron shows them a prototype Artificial Intelligence chip he is working on, code named STEM. On their way home in Asha’s self-driving car, the car gets re-routed to a run-down section of town, crashing into a homeless camp. Four men quickly arrive on the scene, and instead of rescuing them, one of the men, Serk (Richard Cawthorne), shoots both of them, killing Asha and paralyzing Grey. Now a quadriplegic under the part-time care of his mother (Linda Cropper), his home has become fully automated in order to feed and administer medications. Grieving the loss of his wife and frustrated with the police being unable to catch the thugs who killed her and wounded him, he tricks the AI in his home to administer an overdose of his nighttime meds, sending him to the hospital once again. Recovering from the overdose, he is visited by Eron, who offers to implant his STEM prototype to help Grey recover the use of his limbs. Of course, this all comes with a price, and Grey signs a NDA that prohibits him from telling anyone about the technology. STEM, however, has other ideas and quickly helps Grey track down and take vengeance against his attackers. But, at what cost? 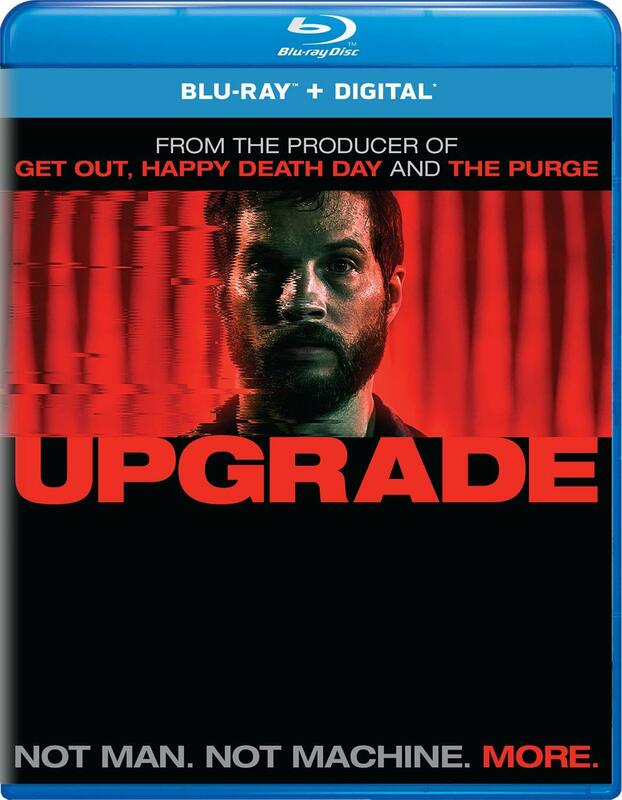 Upgrade is an exciting thriller that is better than it deserves to be, and that is attributed to its smart screenplay and first-time direction by Leigh Whannel (best known for writing the Saw and Insidious series of movies) and a believable performance by Logan Marshall-Green. There is an energy that flows through the film that is intoxicating, with its bizarre camera movements and often eye-popping production design and visual effects, made even more impressive considering the film’s very low budget. Upgrade is a relatively darkly-lit film, taking place mostly at night, and Universal’s Blu-ray release is up to the task. Blacks are deep and inky, with good shadow detail. Fine detail, overall, is quite good, showing off the textured walls inside Grey’s home, his beard stubble, the dust particles floating in the air inside both the morgue and one of Grey’s assailants homes. In a refreshing change, colors are not bleak and subdued as one typically expects in a futuristic film of this nature, they are quite vivid and well-saturated without any noticeable banding. Upgrade comes with a fairly active and immersive 5.1 DTS-HD Master Audio track. The voice of STEM emanates from all five channels giving the impression of the voice coming from inside your head, and the rumbles of the classic muscle car Grey is working on in the opening scene surround you as if you were in the garage. However, there are a few gunshots that just don’t have the low-end impact one expects (but that may have been intentional). Dialogue is clear and understandable throughout. Unfortunately, the only “special feature” is a Digital HD Copy via Movies Anywhere. Upgrade received a very limited theatrical release with almost no promotion, and that is a shame. Hopefully, it will find an audience at home. I was one of the 23 or so people nationwide who saw UPGRADE in a movie theater. Could not believe it wasn’t promoted more — it certainly deserved to be. Reportedly a director’s audio commentary track was recorded for the home video release, but it isn’t on the Blu-ray. Pity. Will likely buy it anyway. UPGRADE shows that creativity and energy can work wonders on a modest budget. Great acting, too.